* The concerned buttons or knob has been operated by pressing or turning. * The points required on the route, the overlap and isolation are set and locked correctly and route is locked. * The track is clear on the Route and the Overlap. * No conflicting movement is taking place or initiated already. * Any level crossing gate interlocked with the signals of the Station is closed against the route traffic and locked. * The crank handles controlling the points on the route, overlap and isolation are manually locked in the proper place and not available for taking to the site of the points. * Any siding connected to the track on which the movement will take place is set to the correct position to facilitate the signal movement and locked. * If it is the last stop signal, line clear is already obtained from next station. * Battery for operating the relays in the relay room. * 24 V DC for Q-series relays. * 60 V DC for K-50 relays of Siemens. * Battery for extending feed to the outdoor relays. * 24 V battery for panel indications. * 110 V battery for operating the points. * 110 V AC (stabilized) for colour light / LED signals. * 110 V AC for feeding battery charger to track feed batteries for track circuits. * Transformers for stepping down 230 V AC to 110 V DC. * Battery chargers (230 V AC) for various battery banks. Size of conductor : 1.5 or 1.6 sq. mm. No. of Cores : 6, 8, 10, 12, 16, 20 and 30. Indoor Cables : For the internal wiring of relay in locations and cabin. The cable is with plain annealed copper conductor PVC insulated, unarmoured flame retarding type. Flexible multi strand wire size 3 / 0.75 mm. Flexible insulated wire size 16 / 0.20 mm. Multi core each core of size 1 mm. Multi core each core of size 0.6 mm. Single core size – 1 mm. * Colour Light or LED Signals. * Relays, batteries, chargers, transformers located in location boxes. * Preparation of the permanent way plan by Civil Engineering Department showing the position of track, point, station building, distance of adjacent station, kilometer of the station etc. 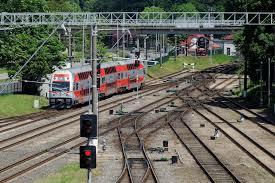 * P-Way plan is examined by the signal department for the suitability of the signalling and then approved. * Preparation of signalling plan showing the location of signals, numbering of points and signals, location of the panel room and relay room, interlocked gates within the station section etc. 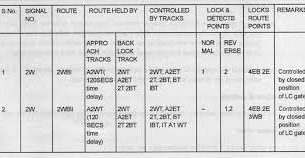 * Preparation of selection / control table showing the conditions to be fulfilled for each signal movement with the associated interlocking needed, track circuits to be proved etc. * Design of the circuits based on the selection / control table. 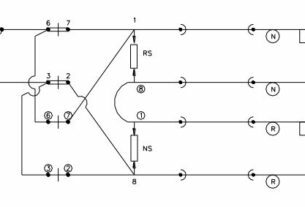 * Preparation of wiring diagram based on the circuit diagram approved, contact analysis of relays and marking contact numbers, repeater relays etc. * Installation of relay racks and wiring of the racks as per approved wiring diagram. * Testing of the actual wiring done. * Installation of power supply equipment, completion of outdoor works like track circuits, signals, fixing of point machines etc. * Commissioning by connecting indoor equipment to outdoor equipment after final testing.